Kuwait, February 01, 2018: Symphony Style Hotel Kuwait played a prominent role and demonstrated its culinary expertise in the recent Horeca 2018, the largest B2B hospitality exhibition in the country, held at the Kuwait International Fair. A team of 10 culinary experts from the award-winning Symphony Style Hotel Kuwait joined hundreds of fellow hospitality professionals in showcasing their talents in a range of live competitions during the seventh edition of the wide-ranging event covering the hospitality, catering and food industry sectors. Hundreds of the leading chefs competed in live demonstrations and Symphony Style Hotel’s food and drinks experts came out on top winning a number of awards: Chef Chinthaka Sandaruwan Gamwara claimedn the first gold medal in the Chocolate Carving category. There was more gold for Chef Chinthaka in the Fruit and Vegetable Carving contest, and he claimed silver for the hotel in the Ice Carving. 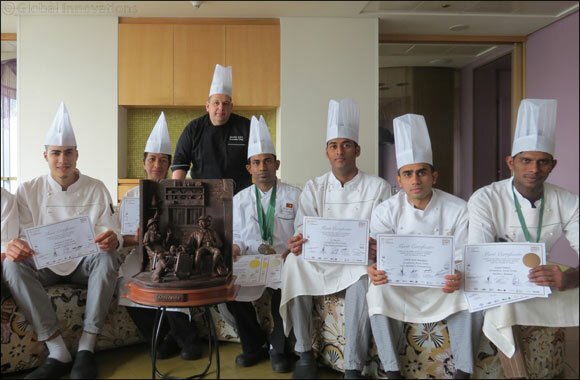 Chef Gopala Reddy Peram demonstrated his creativity and inventiveness by taking bronze in the Mystery Basket competition, a contest in which the chefs were presented with a closed basket of ingredients from which they had to create a superb dish using at least five of the basket’s ingredients. The strong participation in Horeca 2018, emphasizes Symphony Style Hotel’s reputation as a hospitality leader in the region, and highlights its commitment to supporting events that promote local culture and Kuwait as a business and leisure destination. The hotel’s senior management express their extreme appreciation to the skilled chefs who won this tough competition and gained those remarkable medals; and for their continuous efforts in innovating the most distinguished menus and remarkable variety of flavorsome dishes which make Symphony Style Hotel Kuwait a renowned food destination.